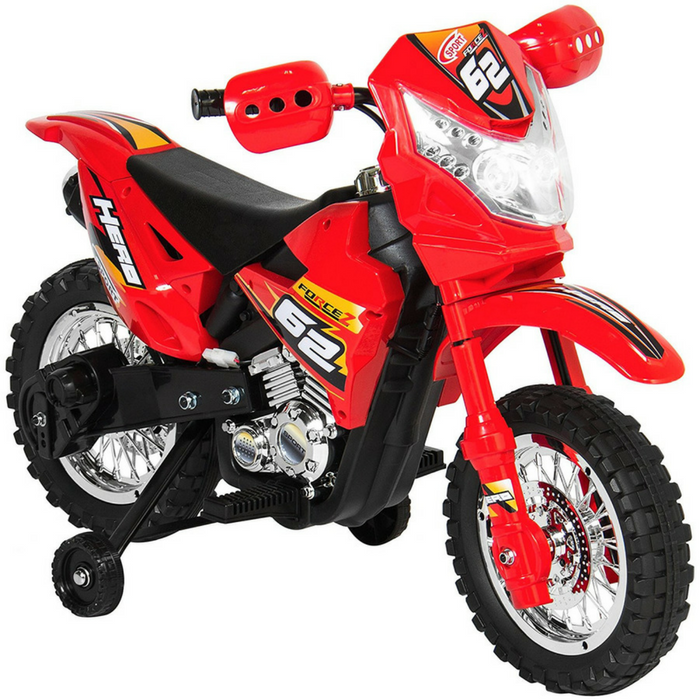 Kid's Electric Motorcycle Just $84.99! Down From $200! PLUS FREE Shipping! You are here: Home / Great Deals / Amazon Deals / Kid’s Electric Motorcycle Just $84.99! Down From $200! PLUS FREE Shipping! Kid’s Electric Motorcycle Just $84.99! Down From $200! PLUS FREE Shipping! Amazon is now offering this Kid’s Electric Motorcycle for just $84.99 down from $199.99 PLUS FREE shipping! This Kids Ride-On Motorcycle, decorated with cool decals and working headlights, comes complete with a rechargeable 6V battery and charger, so you can keep the fun going! Play music through the included auxiliary jack or just steer around as they ride at a max speed 3 km/hr. Help your child develop their coordination and motor skills with this motorcycle by using the attached training wheels. Designed with safety and durability in mind, this ASTM-certified toy is recommended for children 3-8 years old. Overall Dimensions: 41“(L) × 20”(W) × 28”(H); Weight Capacity: 44 lbs.